Motorists will notice new electronic driver feedback signs on city streets beginning this week. Seven of them are going up as part of a year-long $100,000 pilot project to give drivers a sense of how fast they’re going. The signs will be placed around schools, playgrounds and construction zones, Mayor Sam Katz and Winnipeg Police Chief Keith McCaskill jointly announced on Tuesday. 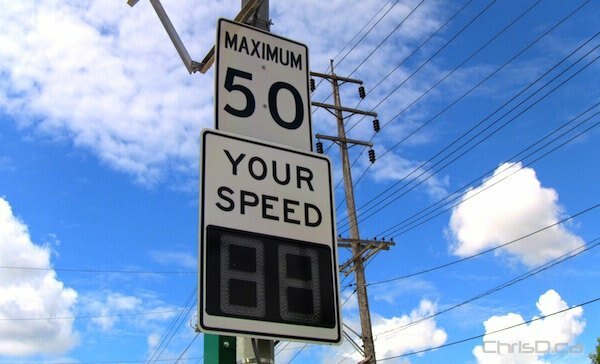 The LED display and radar unit signs are also being used in Victoria, BC, where they’ve proven to be successful in reducing the speed of drivers. Inkster Boulevard near Inkster School (one in the eastbound lane and one in the westbound lane). Grant Avenue near JB Mitchell and John Dafoe Schools (one sign in the eastbound lane). Provencher Boulevard near Provencher Park and Notre Dame Community Club (one sign in the eastbound lane and one in the westbound lane). Bishop Grandin Boulevard near the construction zone (one sign in the westbound lane).